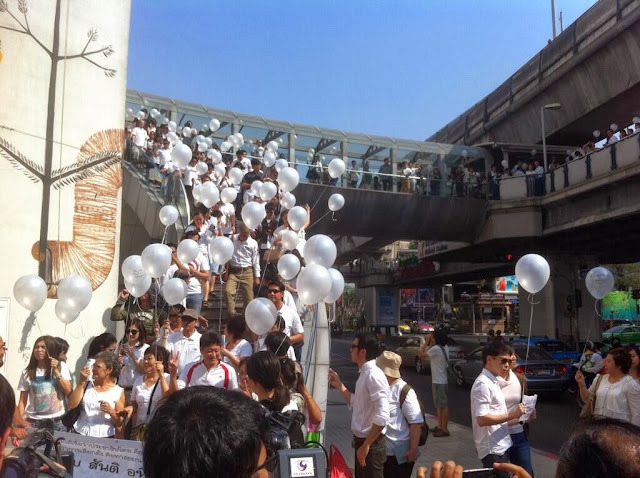 Alt Thai News Network ATNN : Thailand: Regime Scrambles to Rebrand "Red Shirts" to "White Shirts"
Thailand: Regime Scrambles to Rebrand "Red Shirts" to "White Shirts"
Attempts to rebrand regime's violent mobs are aimed at confusing public in Thailand and abroad. January 10, 2014 (ATN) - While regime supporters attempt to claim recent "white ribbon," "white candle," and "white balloon" campaigns in recent days along with the "Respect My Vote" push are a grassroots effort by people who support "democracy" and oppose growing anti-regime protests, it is in fact propaganda campaign engineered and implemented by the regime itself. Image: The regime believes the Thai people, and more importantly, international audiences are as ignorant as they are gullible. Recent propaganda campaigns featuring "white" balloons, candles, shirts, and ribbons are being passed off as a groundswell of support by "the people" in favor of up coming elections. In reality, these campaigns of "support" are being engineered by the regime itself, by it's own "red shirt" enforcers and TV networks. Thaksin Shinawatra's Asia Update TV network has been leading the campaigns for days, with presenters even exchanging their signature "red shirts" for white ones. There has been non-stop coverage of the various staged "white" stunts across the city with participants reciting regime talking-points verbatim. Upcoming February 2, 2014 elections are being opposed by protesters because they are widely seen as illegitimate - dressing up what is otherwise clearly a dictatorship. Much in the way Saddam Hussein's Iraq or North Korea used elections to tenuously disguise what is otherwise overt despotism, Thailand's Thaksin Shinawatra has repeatedly employed elections to vindicate his numerous abuses, including unprecedented human rights offenses. 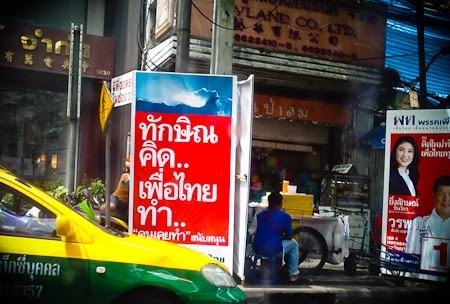 Image: The sign to the left reads, "Thaksin Thinks, Puea Thai Does," the campaign slogan used by Thaksin and his regime in Thailand's last general election. Thaksin, being an accused mass murderer and a convicted criminal, is openly running the country today despite not having been on the ballot nor even being in the country. He runs the country through his placeholder, his sister Yingluck Shinawatra in a display of humiliating 3rd world corruption and nepotism an increasing number of protesters are standing up against. The Western media, despite having reported all of this, still insists Yingluck represents a legitimate, "democratically elected" government. In the days and weeks to come, the regime and its Western backers will attempt to portray pre-planned confrontations with anti-regime protesters as "the people" rising up for their "right to vote." In reality, it is merely the regime's red shirts rebranded to help continue a confrontation they are now finding difficult to sustain.